Snoop was born in August of 2004 and she was one of the most comical puppies I’ve ever know. She was a pretty tiny thing but had these big floppy ears that flapped up and down when she ran. She also barked – only when she ran – so she was quite a sight. Thankfully she grew into her ears and out of the barking habit! Her mother is Sister (how’s that for confusing) and her dad is Dexter. 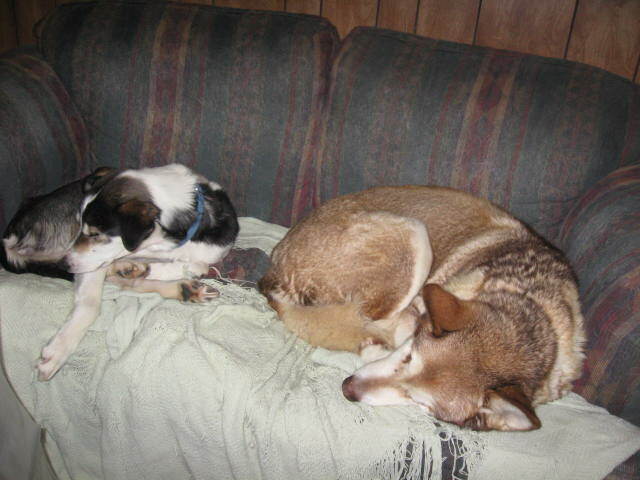 Both these dogs went on to work for Outward Bound in Canada and retired with an awesome musher in Ontario. She’s not a very big girl – weighs about 40 lbs and is quite short coated. Snoop is really a gentle creature and smiles when you rub her chest. She just seems to have lost interest in working and running long distances. She would be ideal for an active person or family. I know she’d still be interested in being a companion to a runner or a skijourer. Snoop is very good with other dogs, big or small. It has been challenging to keep weight on her during our really cold winter weather but in the summer months she maintains her lean physique. She’s never really been much of a pudge. Off leash she is ok, not great. Her recall needs some work. 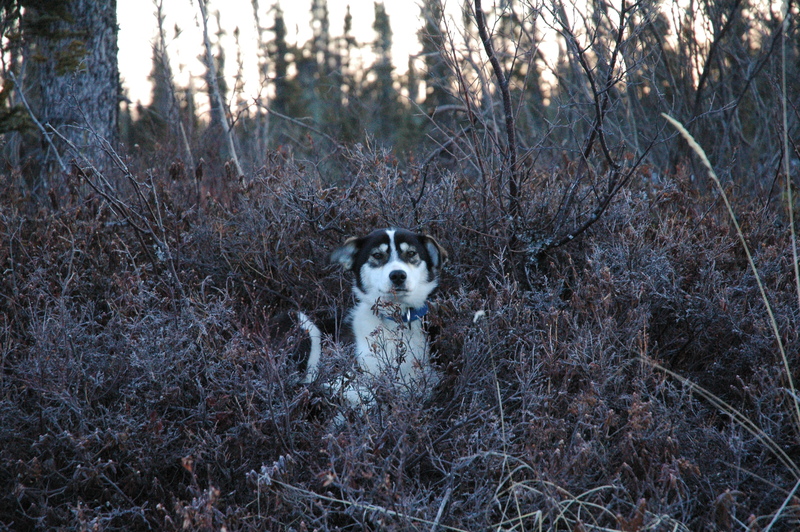 As mushers we are more concerned with go than come back. She is good in the house but should be crated if left alone until boundaries are established. She is current on vaccines. Snoop is still intact. She has never had any pressing health issues or injuries. 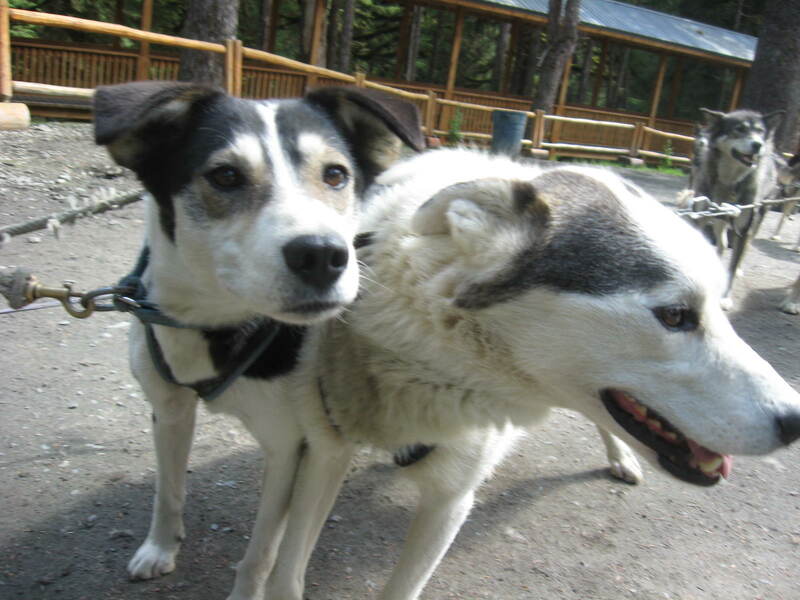 Snoop and her sister Patch in Juneau last summer. She is very inquisitive! Here’s Snoop on her first multi-day trip when she was just 8 months old. She mostly ran alongside the team because she wasn’t quite old enough to bear the workload. Snoop and Kiah on the “dog couch.” Kiah was a very dominant female who barely tolerated other females but she and Snoop were like best buddies. 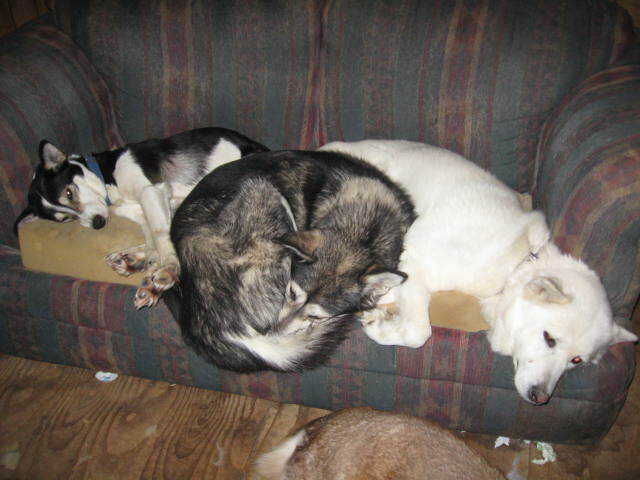 Kiah never shared the couch with anyone else! Snoop, Sneakers (the 3 legged dog who will also be featured on here) and Colonel. Are you sensing there is a couch theme? In a nutshell she is a sweet, sweet girl who would make a wonderful pet. I’d love for her to go to a warmer climate too. Winters are fast becoming her least favorite season. And the other dogs laugh at her when she wears her jacket!